Lewis Carroll's White Rabbit or something else altogether? On one side of a stone archway inside St. Mary’s Church, North Bar Within, Beverley, England, there is a familiar looking carving of a perky upright rabbit, or perhaps a hare, holding a messenger bag, long suspected of being the inspiration for Lewis Carroll’s (aka Charles Ludwidge Dodgson) White Rabbit in Alice in Wonderland. Although not mentioned in his journals, it is possible that a young Dodgson saw the 18” carving during one of his family’s outings in the area. 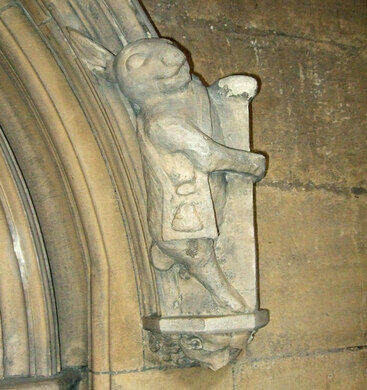 The carving itself is most likely a representation of the messenger hare in the well known cautionary fable written by Odo of Cherinton, who was a Catholic preacher and writer in the 13th century. His tales had a lot in common with Aesop, with animal protagonists adapted to illustrate Christian moral principles. The hare features in a tale wherein a group of lazy townspeople realize at the last minute that they are late to pay their rent, and they seek out and catch a hare, which are known for speed and agility. After placing their rent in a pouch tied to the hare, they instruct it to race to their landlord, but of course it takes off in another direction and is never seen again. 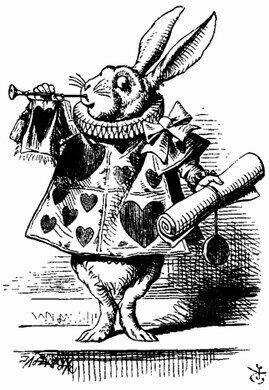 In Alice in Wonderland, the White Rabbit’s tardiness and panic are said to be inspired by Dean Liddell, the father of the real-life Alice (Alice Pleasance Liddell). Dean Liddell was notoriously late for appointments. Lewis Carroll’s family spent time in the Beverley area when visiting with his grandfather as a child, and he sent Alice’s illustrator John Tenniel far and wide in search of visual inspiration. But unless some new evidence comes to light the connection between the Beverley messenger hare and the White Rabbit remains a mystery. It has also been suggested that he may have been inspired by a misericord in the choral room at Ripon Cathedral, where his father was a canon when Carroll was a young man. The carving depicts a rabbit escaping down a hole. Carroll is known to have worked on Through the Looking Glass while in Ripon, and the Queen of Hearts and Cheshire Cat make appearances in the south transept in honor of the connection. This mummified mermaid corpse is an aquatic curio that was eventually revealed to be a fake. Explore Hull's historic Old Town by following the sea creatures scattered throughout its charmingly cobbled streets.